It was in the early morning of a cold, rainy November when I drove by an elementary school. I looked to my left and an adorable, sweet human caught my attention. I pulled the car over and watched in silence, with only the faint sweeping sound of windshield wipers. A little girl, who couldn’t have been more than 7 years old, was walking across the soccer field. She carried a bright pink umbrella. Hiding in its shelter, she combated the heavy rains and blustery winds, determined to get to her school. The winds were so powerful that, all of a sudden, its force pulled the umbrella from her tiny grip. The umbrella starts rolling and jumping across the field. Startled, she began chasing it. Each time she went to reach for the handle, the wind would roll it a few more feet. She tilts her head back and laughs as though to say, “silly wind”. Her predicament turned into a playful game. At last, she captures her umbrella. 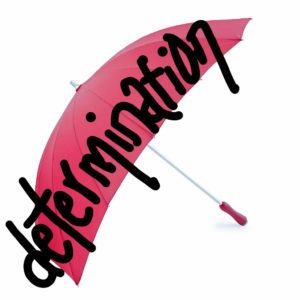 With laughter in her eyes and her bright pink umbrella firmly clasped, she shields herself and continues her journey. The dry warmth of the classroom awaiting her. This story is one of my favourite metaphors for what pure determination looks and feels like. In the professional world, the expression “behind the 8 ball” is a common idiom; meaning, an unfavorable, uncomfortable or difficult position. And sometimes, what appears to be, a losing one. What do you do when something becomes harder than you anticipated? We’re caught off guard. Like deer in the headlights, we’re stunned and perplexed. Here’s the good news: it’s temporary. Yes, we’ll lose our grip… sometimes. But we overcome, again and again. And our grip only gets stronger, not weaker. The little girl didn’t anticipate the wind. She was merrily on her way to school and, the next thing she knows, she’s chasing after her umbrella! It was an interruption to her morning. But once it was over, her interruption became a funny story to share with her friends; and an inspiration to the on-looker (me). What did I learn from the little girl with a pink umbrella? Challenges are not threatening. The little girl didn’t feel threatened by the wind. Staying true to the course, even in the storm, is normal. She was determined to get to school with her umbrella. Hardships are not a sign to stop. The young child, unexpectedly, had to get her umbrella back, and she still made it to school on time. Find the hint of joy in the struggle. The wind became her playmate. She reminded me that I can still find joy amidst challenging moments. Interruptions are not your defeat. They simply sharpen your mind and are there to remind you that you’re a true overcomer. Losing your grip does not mean you quit. Although the little girl lost her grip the first time, she never lost her grip again. The strength you show in your determination is contagious and leaves a lasting impression on others. Hardships are not a lifestyle, they are simply a moment in time. Although the impact sometimes feels like a lifetime, it’s not. This too will pass. The girl with the pink umbrella has become an icon that is forever embedded in my memory. This story happened in 2009, yet it continues to live vibrantly inside me. Her determination inspired me, and still does. She will never know the impact she had on me. What if your determination becomes a source of inspiration and encouragement to someone else? Persevere. You will overcome. Remain strong. There is a reward coming your way for your hard work. Schedule a free 20 minute consultation here, let’s talk!